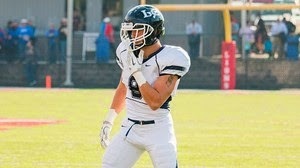 ANNVILLE, Pa. - For the fifth time this summer, Lebanon Valley College senior linebacker Frank Gaffney has picked up a preseason all-America honor, this time from D3football.com. Gaffney, who was a D3football.com Second-Team All-American last year, earned a spot on their first team for the 2014 preseason. He has also been on preseason lists by BSN, USA College Football, the Sporting News, and Lindy's this summer. Gaffney will look to repeat his standout junior season that saw the Dutchmen (8-3 in 2013) win the Middle Atlantic Conference title and qualify for the NCAA Tournament. Gaffney was one of four MAC players on the first team list, along with Widener wide receiver Anthony Davis, Lycoming safety Tanner Troutman, and Albright kicker Dan Sobolewski. Lebanon Valley's season begins Sept. 6 at Franklin & Marshall, renewing an old rivalry that hasn't been played since 1982. The team reports for camp Aug. 13.